This is the 6th in a newly released series of Patrick Page – Magic Gold DVDs. The late Patrick Page was recognised the world over as one of magic’s greatest teachers. His knowledge, experience and willingness to share what he knew, made him a cherished and much missed figure on the magic scene. The material in this DVD is ideal for beginners and experts alike. From the professional making a living from performing magic to the magic enthusiast. For close up and stage magic. There is something for everyone. Patrick Page was a leading authority on all things magic. In this DVD Patrick Page talks about balls – sponge balls. 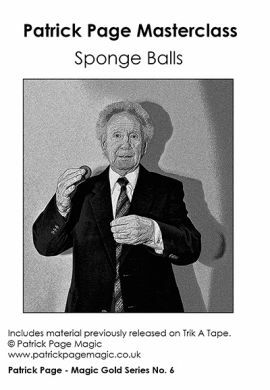 He explains different ways to vanish sponge balls (and billiard balls, eggs and other objects) as part of a close up act or on stage or as a silent, comedy act for larger groups. Learn how to vanish a ball in your left hand whilst sitting down or vanish two balls standing up in front of your body. Make balls pass through a table, make them appear and disappear as part of a variation of the Benson Bowl routine, produce an endless supply of balls from your mouth, blow up a small ball to create a giant sponge ball, cut balls in half with your finger, change the size and colour of the object (and even change it into another object such as a lemon or a handkerchief). Patrick Page shows you how to perform all these magic effects. The DVD includes the full Patrick Page sponge ball routine that he used in his act and earned a living from over many decades, and gives you ideas about timing and misdirection that will make your act different and more convincing. Patrick explains how to use props such as a bowl, a chop chop, a purse frame, a dye tube and even a top hat, as part of your act using sponge balls. Includes material previously released on Trick a Tape. The Patrick Page Masterclass – Sponge Balls DVD is priced at £12 (approx US $16) inclusive of free worldwide postage and packing (shipping). It is sent to you by first class post. Please make payment by Paypal. The DVD is a Pal version for use on Pal tv systems but should work on most computers. We have many satisfied customers. Here’s what one of them (DR) had to say about the Patrick Page Masterclass Sponge Balls DVD.